April 4, 2011 - The Swiss pilots union AEROPERS announced that negotiations with SWISS Airlines, a wholly-owned subsidiary of Lufthansa, had broken down. In late March, Switzerland television reported on pilot fatigue as an issue in the ongoing labor dispute. The SWISS pilot’s contract had expired April 1 and an eventual strike is a possibility. Christoph Franz, the new Lufthansa Group CEO, was the CEO of SWISS in 2006 when another group of SWISS pilots went on strike. SWISS is a vital part of Lufthansa and in 2010 had the highest operating margin of all airlines in Lufthansa’s group. In the U.S., the airline operates trans-Atlantic flights to New York, Los Angeles, Chicago, Boston, Miami, San Francisco and Newark. Labor relations have been an issue elsewhere at Lufthansa. 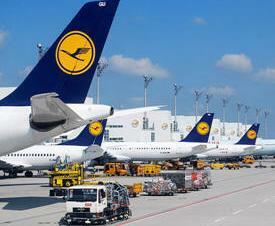 In February of 2010, Lufthansa pilots went on strike for one day, causing 3200 flight cancellations. Union negotiations are ongoing at Brussels Airlines, of which Lufthansa owns 45% and an option to purchase the rest of the company. In January, the unions representing ground and flight crews at Brussels Airlines issued a warning that a strike was possible. In September 2010, UNITE, the UK union, filed a lawsuit against BMI, a wholly-owned Lufthansa subsidiary. The suit alleges wage raises that BMI had promised were not paid. Additionally, the Lufthansa-led restructuring of BMI resulted in 750 job losses last year. At subsidiary Austrian Airlines, workers in the Austrian Airlines ground personnel works council protested Lufthansa’s imposition of a new director in December 2010. In January 2011, workers at the airline reached a contract settlement just averting a strike. UNITE HERE, the union representing 6,900 of Lufthansa Group’s 12,400 North American employees, is also involved in negotiations with the company. Despite returning a consistent profit through the economic crisis, Lufthansa subsidiary LSG Sky Chefs, which provides catering for major airlines at over 30 U.S. airports, has let negotiations in the United States go nearly a year past contract expiration. In contrast, Sky Chefs’ primary competitor, Gate Gourmet, recently reached a national agreement with the union. “We are disappointed in Lufthansa’s apparent approach to labor relations, which around the world is causing problems for travelers and workers alike,” said Jim DuPont, International Vice-President of UNITE HERE.